Based on the original 1981 “GUITAR MAN” album, FTD Vinyl’s new release contains all the tracks featured on the FTD CD release from 2000. The 2-LP features full overdub session data insert. Pressed on 180 Gram heavyweight vinyl, it’s availability is strictly limited as all previous releases. *Taken from the album “I Was The One,” 1983. I own the original "Guitar Man" LP. This FTD 2 disc LP is a step up from that release. I really love the 180gm pressings. There is so much technical data that comes with it. I enjoyed reading all the info and the sound quality is pure. 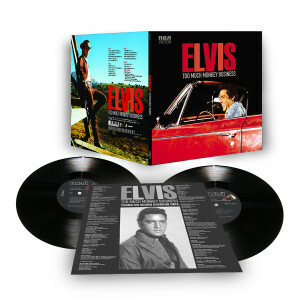 The instrumental backing and of course Elvis' voice makes it sound like he just recorded it yesterday. I paid a bit for shipping (3 FTD LP's) but my order came so well packaged and in mint condition.